This charging plate is made with a gold leaf and glow cast of a very precise Sri Yantra. 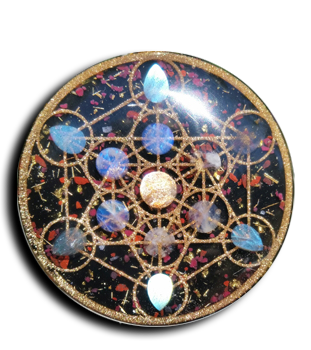 It is inlaid with Labradorite, Sodalite, Opal, Carnelian and Amethyst. Smooth front and back. he Sri Yantra represents the union of Masculine and Feminine Divine. It is made up of nine interlocked triangles. Together the nine triangles are interlaced in such a way as to form 43 smaller triangles in a web symbolic of the entire cosmos or a womb symbolic of creation. The Sri Yantra is a symbol of balancing opposites and also of prosperity.